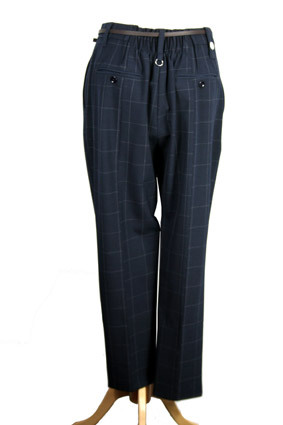 High 'Workday' check trouser blue with grey square line check. Button, zip and clip fly, fabric pull with metal trims on zip. Belt loops with narrow leather belt with metal buckle. 2 side pockets with grey stitch detail. At the rear the waist is ruched (stretch) in the middle of the rear waistband. 2 rear pockets with button fastening. Superb trousers.